This map was requested by my local ARES coordinator to show the extent of the American Radio Relay League (ARRL) East Bay section of Amateur Radio Emergency Services (ARES). The data source is a combination of county divisions from Cal-Atlas (http://www.atlas.ca.gov/) and the ArcGIS Data & Maps 9.3 DVD. Portfolio of Maps: in October 2009. Adelaida Road, San Luis Obispo County, California: at cemetery. Field Notes: 15 Oct 2017. The city of Fremont is directly below the mountain, and Coyote Hills are in the middle distance. Mission Peak as seen from the west. U. S. Interstate 880: near Mission Blvd. San Francisco Bay in the early morning. Photograph taken in the early morning on 4-Dec-05. Former mining offices at Almaden, California. Former mine at Almaden, California. The concrete structures were ore bins. Looking north toward San Jose from Alamden, California. Oak tree in the hills at Almaden. View of Atascadero on a hazy winter afternoon. This view is looking east from a hill on the west side of Atascadero. The city hall of Atascadero is the domed structure in the center of the photograph. The Salinas River is behind the city hall and the hills to the right and left. Photograph taken in January 2002. U. S. Highway 101: in Atascadero. The 4Runner with 100,000 Miles. Photograph taken 25 April 2005. As we were descending into Bakersfield on California Highway 58, the 4Runner turned over 100,000 miles at General Beale Road. We got off to buy some produce and to take this photo. Osprey on San Leanadro Bay. Bay Farm Shoreline Path, Alameda, Alameda County, CA: near Veterans Ct..
Bay Farm Shoreline Path, Alameda, Alameda County, CA: at Pkt Landing Rd. Bear Valley Reservoir, seen from Tilden Park. Photograph taken 1 May 2005. Big Sandy Road, Monterey County, California: near end of road. Field Notes: 1 Feb 2013. Junction of CA Hwy 25 and Coalinga Road near Bitterwater. Coalinga Road provides access to Clear Creek and the New Idria area. Coalinga Road - San Benito County: at CA Highway 25. California Highway 25: at Coalinga Road. Bitterwater, San Benito County, California. There are many places named "Bitterwater," "Bitterwater Lake," or "Bitterwater Spring" in California. The DeLorme Atlas lists 8 places. Gudde's (1969) California Place Names notes that there are more than 50 Bitter Creeks and Lakes and Bitterwater Canyons in California. "Amargosa" is the Spanish adjective for "bitter." Bradley Road, Monterey County, California: 13609. U. S. Highway 101: near Bradley. Bradley Road, Monterey County, California: Bradley. Cooperative Cotton Gin near Buttonwillow. Cotton is a major crop in the southern San Joaquin Valley. This very large cotton gin is along side California Highway 58 near Buttonwillow. Photograph taken in May 2001. Nearly every gas station, fast food joint, and cheap motel chain is represented at Buttonwillow Junction. The actual town of Buttonwillow is 3 miles west on Highway 58. Photograph taken in May, 2001. California Highway 58: Buttonwillow Junction. U. S. Interstate 5: Buttonwillow Junction. California Highway 58 crosses the California Aqueduct near Buttonwillow. Photograph taken in May 2001. The agricultural businesses of Buttonwillow have grown up on both sides of California Highway 58. Photograph taken sometime in Summer 1954. Hope Valley, looking southwest from CA Hwy 89. Photograph taken July 31, 2004. Cayucos in golden autumn light (aided by California wildfires). Looking toward Cerro Gordo from the vicinity of the Sunset Mine. Photograph taken July 16, 2005. Field Notes: 16-Jul-05 at Cerro Gordo. Looking up the Cerro Gordo Road. View of Owens Lake and Keeler from the Cerro Gordo Road. View of Cerro Gordo from the entrance to the town. Front of the American Hotel. Steve wanted me to think we were going just a little way up this road …. … but I knew we were going to the top. Hoist House, Cerro Gordo Mine. Sign at the bottom of the hill. Two guys on top of the hill. Steve has lunch on the porch of the American Hotel. Last Mile of Cerro Gordo Road. General Store in Cerro Gordo. The Cerro Gordo Road works it way up the hill. Lower end of tramway at Cerro Gordo. Cerro Gordo from a ridge to the southwest. Photograph taken March 22, 2008. Parkfield Grade, Fresno County, and Parkfield Coalinga Road, Monterey County, California: 40000. Union Pacific Railroad bridge over the Consumnes River. Photograph taken 8 November 2009. County Route J8, Walnut Grove Road, Mono County, California: Consumnes River Preserve. Mount Diablo as seen from Mission Peak. The Sunol area, traversed by US Interstate 680 is in the foreground, and the Pleasanton - Dublin area is in the middleground. This is a CNPS field trip to see a small population of Cordylanthus mollis at Point Edith. Field Notes: CNPS Field Trip to Point Edith. Excerpt from: Crawford, J. J., 1894, Twelfth Report of the State Mineralogist. California State Mining Bureau. Goleta Mine (Quartz).—It is on the eastern base of the Sierra Nevada Mountains, 6 miles N.E. of Lundy. It is one of a series of mines on an immense ore deposit running N. and S. This has not yet been opened sufficiently to show its pitch; the eastern wall is limestone, the western a porphyry-like rock. On the eastern side of this deposit is a vein of copper ore (malachite), 6 to 20 ft. in width, and averaging 8 per cent of metallic copper. The copper carbonate impregnates an exceedingly crushed and decomposed rock. On the west is the gold and silver vein. This is much decomposed on the surface and in most of the workings, the quartz being honeycombed and in places almost replaced by the decomposed rock-mass and iron oxides. The quartz is evidently a replacement of the rock along the mineralized zone. The deposit is opened by two tunnels. The lower one is 1,190 ft. long and has not yet cut the ore body. The upper tunnel is 359 ft. above, and has a length of 360 ft. The copper vein has been drifted on N. 156 ft. and S. 182 ft. The upper tunnel runs through the quartz vein 67 ft. without striking the western wall. A drift has been run N. 40 ft. and S. 30 ft. From the south drift a winze has been sunk 56 ft. There are two cross-cuts on the vein from the north drift, 23 and 47 ft., without reaching the western wall. From the south drift two other cross-cuts have been run, respectively 38 and 49 ft. long. In places the decomposed ore is replaced by hard quartz, carrying iron sulphurets. The value of the ore is about equally distributed between gold and silver. On the same mine to the south and 400 ft. above, a shaft has been sunk 65 ft. on the vein. At this point the vein is 24 ft. wide. This is perhaps the largest ore deposit in the county, being traceable for over 7,000 ft. See our VIIIth Report, pp. 364 to 365. Goleta Mining Company, 330 Pine Street, San Francisco, owners. Montecito Mine (Quartz).—It lies 6 miles N.E. of Lundy, and joins the Goleta on the south. On this claim two tunnels have been run, 33 and 80 ft. long, respectively, cross-cutting the vein, but without reaching the western wall. A shaft has been sunk 40 ft. The character of the ore is the same as the Goleta. 1). E. Jones, of Lundy, Superintendent. Native Wonder and Mono Queen Claims (Quartz). —These properties were discovered the past year and have been only slightly developed. The Native Wonder is situated on the north side of a steep canon, west of Mono Lake, while the Mono Queen is opposite, on the south side of the cation. The Native Wonder runs nearly E. and W., and has been opened by a short drift showing a vein 18 in. in thickness. The Mono Queen is a blanket vein, and has been opened by a tunnel 70 ft. long. The ore is honeycombed, and is said to be high grade. E. C. Mattly, of Mono Lake, owner. Spartan Mine (Quartz).—This mine lies S. of that part of the Sterling Company's mine which was formerly known as the Detroit Copper Mine. Two tunnels have been run to cross-cut the vein. The upper is 120 ft. long, of which 90 ft. is in mineralized vein matter. The other tunnel, 180 ft. below, has at present a length of 245 ft., and is being run through limestone. The vein matter is partly a mineralized limestone and partly a porphyry. M. R. Burns, of Lundy, owner. Sterling (Detroit Copper). Mine (Quartz).—The property of the Sterling Company lies about 6 miles N.E. of Lundy. One claim lies north of the Goleta, and on the same ore body, and the other south of the Montecito. The claim on the north has been opened by a shaft 115 ft. deep. That on the south was formerly known as the Detroit Copper Mine, and was described in our VIIIth Report, pp. 364 to 365. In past years a large amount of work was done on this mine in an attempt to extract copper from an E. and W. vein. Sterling Mining Company, No.330 Pine Street, San Francisco, owners; D. E. Jones, of Lundy, Superintendent. View of Danby Lake playa. Photographed by Robert E. Reynolds, December 4, 2013. Cadiz Road: at Salt Marsh. Field Notes: 4 Dec 2013. Vegetation on Danby Lake playa. Sesuvium verrucosum on Danby Lake playa. View mounds on Danby Lake playa. Photograph taken August 3, 2003. San Juan Grade Road: 35000. Photograph taken 28-Apr-07 from Old Stage Road, just south of Natividad. The Fremont Peak Observatory Association is at http://www.fpoa.net/. San Benito County Route G1: at Observatory. End of the road at Fremont Peak. There are two campgrounds. Valley View Campground is just down the road to the left, and Oak Point Campground is on the knoll in the center of the photo. The main picnic area is between the parking lot and the Oak Point Campground.The Fremont Peak Observatory is out of the photo to the right. San Benito County Route G1: at Parking Lot. San Juan Bautista as seen from Fremont Peak. San Juan Bautista and the San Juan Valley are in the middleground. The view is just west of north. Interpretive sign at Fremont Peak. This interpretive sign is at the upper parking lot, near the trailhead for the peak trail. Fremont Peak was called Gavilan Peak in early Spanish times, Gavilan in English meaning hawk. In 1846, Capt. John Charles Fremont brevet captain of topographical engineers of the United States Army, was conducting a survey and exploring expedition in Oregon and California. His presence with an armed force in the settled area was objected to by Prefect Manuel Castro and General Jose Castro and the California authorities. He was ordered to leave. Instead Fremont prepared to resist this request. He ascended Gavilan Peak where he built a fort of logs. A sapling was cut for a flagpole and on March 6, 1846, Fremont raised the flag of the United States. Castro had his forces below at San Juan Bautista. But before any attack was made, Fremont's flagpole blew down on the afternoon of March 9. Fremont taking this as a bad omen broke camp in the night and moved on toward the San Joaquin. So open battle was avoided. After this episode Gavilan Peak again became the meeting place for hawks. San Benito County Route G1: 89000. Photograph taken 28-Apr-07 from the San Juan Highway north of San Juan Bautista. U. S. Highway 101: in the San Juan Valley. Coalinga Mineral Springs Road: near Coalinga Mineral Springs. Field Notes: 5-Feb-06 at Coalinga Mineral Springs. Coalinga Mineral Springs Road: 50700. Field Notes: photos from Ed Kreyenhagen. Oil field northwest of Coalinga. Photograph taken 4-Feb-06 on Derrick Road between downtown Coalinga and Los Gatos Road. Coalinga Mineral Springs Road: at Coalinga Mineral Springs. Coalinga Mineral Springs Road: 50600. Field Notes: 5-Feb-06 in Coalinga. Coalinga Mineral Springs Road: 52000. This house was pointed out to us as being "historic" by the folks in the museum. Field Notes: 4-Feb-06 on Los Gatos Road. Looking southwest on the main street of Coalinga. Stonewall Canyon with Salinas Valley beyond. California Highway 146: near Stonewall Cyn. A portion of San Juan Grade Road. San Juan Grade Road: 34999. California Highway 146: south side of Stonewall Cyn. Field Notes: 12 Oct 2017. U. S. Highway 101: at rest stop. Photographed January 1985, scanned from a print 8 February 2018. Bald Hills Road, Humboldt County, California: at Lady Bird Johnson Grove. Field Notes: 17 Oct 2017. Photographed August 1980. Scanned 29 January 2018. Bald Hills Road, Humboldt County, California: at unnamed road. Field Notes: at Redwood National Park. Photograph taken August 1, 2003. Photo was taken from the main flow of the Eel River. The North Fork of the enters under the railroad bridge, and the South Fork enters from the right, behind the minivan. U. S. Highway 101: 424990. Photograph taken August 1, 2003. U. S. Highway 101: 424980. Mary Austin house in Independence on U. S. Highway 395. Mary Austin wrote many books about the desert, the most well-known is The Land of Little Rain. U. S. Highway 395: at Main St in Independence. General view east along Coalinga Road. Photograph taken in early April, 2000. View east toward the Clear Creek and New Idria area. Coalinga Road - San Benito County: at the pass. Field Notes: 16-Jul-05 at Keeler. Sierra talc plant in Keeler. Looking south across Walker Pass. Photograph taken July 15, 2005. California Highway 178: at Walker Pass. Looking west from California Highway 58, Cymric Oil Field on ridge. Photograph taken 19 April 2005. Looking northeast toward Buttonwillow along California Highway 58. View from Robber's Roost toward Freeman Junction. We turned off of Highway 178 at what I now think was Soldier Wells, and followed a little road in the direction of Robber's Roost. It was a good little road, but there were no recent tire tracks. The reason why there were no tire tracks on the little road became obvious when we arrived at Robbers Roost. In the middle of the road was a red stick. On our side it said nothing. But the other side, "Route Closed." After taking the photograph, we drive around the sign. There was no way I was going to drive all the way back to Highway 178, and then try to find a route that was not closed. Looking south to Robber's Roost from Soldier Wells. Robber's Roost was used by the robber Tiburcio Vasquez from about 1850 to 1874. He and his gang robbed stages and freight wagons carrying gold ores and bullion from the mines of the Eastern Sierra to Los Angeles and Bakersfield. As a defense against his robbery the Cerro Gordo mines made 300 pound silver balls that couldn't be carried on horseback. This was a great little road. But we noticed it had not had much traffic on it lately. California Highway 178: at Soldier Wells. View northwest from Walker Pass. I think the flat topography in the distance would be termed the Kern Plateau. California Highway 178: near Walker Pass. Blackwells Corners, "World's Largest Parking Lot"
Cheryl at the Desert Tortoise Natural Area. Steve inspects the weather station in Walker Pass. There is also a Walker Pass RAWS station a few miles west. Steve is on the Pacific Crest Trail. The vegetation here is Pinyons, Juniper, Big Sagebrush, and Bitterbrush. Lonoak Road in King City. California Monterey County Route 15 (Metz Road): corner or 1st St. and Lonoak Rd..
Lonoak Road: in King City. Field Notes: 4-Feb-06 in King City. Broadway Street, the main street of King City. King City was named for C. H. King, who laid out the town on his Rancho San Lorenzo when the Southern Pacific was extended to that place in 1886. Monterey County Route G-13 follows Broadway Street while in King City. California Monterey County G-13: at US Hwy 101. U. S. Highway 101: in King City. Photograph taken March 20, 2008. California Highway 24: in Lafayette. U. S. Highway 395: Lake Crowley. Lake Tahoe at Kings Beach. Looking south toward Freel Peak behind Heavenly Valley and South Lake Tahoe. California Highway 28: Kings Beach. View of Lassen Peak from Emigrant Pass. California Highway 89: Emigrant Pass. Field trip to Lassen National Park. Photographed October 1980, scanned from a print 6 February 2018. Engine No. 9 started her career on the N.C.O. prior to being assigned to Owens Valley service in 1929. Silver Canyon Road: Laws Railroad Museum. Field Notes: 17-Jul-05 at Laws. The train at the Laws Railroad Museum. U. S. Highway 6: in Laws. Front of the Laws Museum. Old cars protect the bank from erosion along Lewis Creek. At Lonoak, Lonoak Road crosses Lewis Creek and passes between Monterey and San Benito Counties. Here old cars have been placed along the creek banks to reduce erosion. I have some photos of Lewis Creek a little further upstream that show a broad alluviated channel with a small stream in the middle, a sign that the stream is quite underfit, i.e., the sediment load far exceeds the carrying capacity of the stream. Lewis Creek drains a fairly large area that includes Priest Valley, following the San Andreas Fault Zone from there to this location in Lonoak. The combination of a large drainage area, steep topography, and ground-up rock in the fault zone, probably yields some high flood waters with large sediment loads on occasion, leading the local residents to try embedding the autos in the creek banks to reduce erosion. Field Notes: 4-Feb-06 near Lonoak. Field Notes: 4-Feb-06 at Lonoak. Looking upstream on Lewis Creek. I'm not really into the bed and breakfast scene, but this was probably the best B&B experience I've had. U. S. Highway 101: Southport Landing B & B. This is a very interesting stop. They make cheese seven days a week. U. S. Highway 101: 408010. I left Lone Pine early one May morning, bound for the Nelson Range and Hunter Mountain. The sun had just come up over the Inyo Mountains and was shining stongly. I pulled over just to take this picture of Mount Whitney from U. S. Highway 395, near Lone Pine. U. S. Highway 395: Lone Pine. View of Evergreen Cemetery, Graves of Anna and Peter Pawluk in Foreground. The graves are located in Evergreen Cemetery, Section E, Plot 4500. U. S. Interstate 5: 80050. Gravestones for Anna and Peter Pawluk. Tom just behind the graves of his grandparents, Anna and Peter Pawluk. Photographed May (?) 1957, scanned from a print on 19 February 2018. Field Notes: in May 1957. Red Cones as seen from Mammoth Mountain. Photograph taken August 4, 2010. Field Notes: 4 Aug 2010. Manzanar, on U. S. Highway 395 south of Lone Pine, was an one of ten internment camps where 110,000 people of Japanese ancestry were sent to live during World War II. Jeanne Wakatsuki Houston's 1973 book, Farewell to Manzanar, is a very readable account of one young woman's experience there. U. S. Highway 395: at Manzanar. Stinson Beach is on sand bar that closes the mouth of Bolinas Lagoon. The ridge in the center distance is part of Point Reyes National Seashore. The San Andreas Rift Zone crosses the sand bar, passes through Bolinas Lagoon, and continues to the right (east) of the ridge line. San Francisco from Muir Beach Ovelook. Cheryl surveys the coast from Muir Beach Overlook. The point of land in the distance is Duxbury point, to the left of which is Duxbury Reef. Just visible over Duxbury Point is the faint outline of Point Reyes. Looking east across countryside north of Tomales. Tomales Bay from Mount Vision. Houses in the trees of the town of Inverness. Millerton Point is across the bay on the right. Mount Saint Helens is in the diatance. Looking north toward Bodega Bay from the hill above Dillon Beach. Looking east across Tomales Bay. Highway 1 is across the bay, in the trees near the water. Point Reyes from Mount Vision. The road is closed now short of the summit of Mount Vision. So this is a view from nearby. This view shows Drakes Estero and Drakes Beach with Point Reyes beyond. The lighthouse is on the farthest, right-most point. Sir Francis Drake Boulevard: Point Reyes. Muir Beach from Muir Beach Ovelook. California Highway 1: Muir Beach. Photograph taken May 13, 2005. California Highway 140 descends the canyon of Bear Creek. Bear Creek along California Highway 140. Bear Creek drains an area near Mariposa into the Merced River. View of the town of McKittrick. McKittrick is an oil town in the southeastern San Joaquin Valley. Photograph taken 13 Sept 2009. Branscomb Road, Mendocino County, California: at US Hwy 101. U. S. Highway 101: at Branscomb Rd. The sand bar, on the other side of the river is in Sonoma County. California Highway 1: in Gualala. Field Notes: 16 Oct 2017. California Highway 1: in Fort Bragg. Stop at Mineret Summit for a view of the Minerets and the valley below. We didn't. Just zoomed right on by. Then when we turned the corner and saw the view, we had to find a place to turn around, and go back. This picture was taken in early morning. California Highway 203 - Eastern Sierra: Minaret Summit. Cholame Road, Monterey County, and Cholame Valley Road, San Luis Obispo County. : in Cholame Valley. V6 Ranch from the road. Parkfield Grade, Fresno County, and Parkfield Coalinga Road, Monterey County, California: above V6 Ranch. Victor Roberts was a pioneer to the area, immigrating from France to California in 1871. He homesteaded 160 acres of land, on the banks of Jacalitos Creek, at the base of Parkfield Mountain, through years of hard work he developed a fine 15000 acre cattle ranch. Victor's brother, immigrated from France in 1891 after serving in the French Army. Marcellin homesteaded 160 acres near the top of Parkfield Mountain. He build his house with a view of the valley below. He helped build the Parkfield Road and became the county road boss. Baptiste was a nephew of Victor and Marcellin Roberts. Baptiste immigrated from France in 1897 and homesteaded 160 acres, on a branch of the Jacalitos Canyon. This branch became known as Motte Canyon. In 1910, he moved into Coalinga and worked in a grocery store owned by A. P. May. Baptiste started his own grocery market in 191 and it remained in business until the Coalinga earthquake in 1983. Parkfield Grade, Fresno County, and Parkfield Coalinga Road, Monterey County, California: 30000. Parkfield Grade, Fresno County, and Parkfield Coalinga Road, Monterey County, California: 35000. Ranch house along Vinyard Canyon Road. Vinyard Canyon Road, Monterey County, California: in Vinyard Cyn. Monitor Pass with Leviathan Peak in the background. California Highway 89: Just West of Monitor Pass. Sagehen Flat and Heenan Lake, looking south. This photo was taken from Leviathan Mine Road near its intersection with California Highway 89. Looking south, Sagehen Flat is in the foreground, and Heenan Lake in the background. I think the mountain in the distance is Mineral Mountain. Photograph taken August 1, 2004. California Highway 89: View Point of Slinkard Valley. Lunch stop on Loop Road (Morningstar Road) near Monitor Pass. Sweetwater Mountains and Antelope Valley. Beginning of CA Highway 89 at US Hwy 395. California Highway 89: at US Hwy 395. U. S. Highway 395: at CA Hwy 89. Wyoming Indian Paintbrush (Castilleja linariifolia) near Monitor Pass. Photograph taken July 31, 2004. My collection #439. Humboldt-Toyiabe Forest Road 31083 "Big Spring Loop," Alpine County, California: in valley. California Highway 89: at FR 31083. Field Notes: 31-Jul-04. Coll. No. 439, 31-Jul-04. Leviathan Mine Road, Douglas County, Nevada, and Alpine County, California: Leviathan Mine. Silver Peak from Monitor Pass. The entrance to the park is at the south end of Moss Landing. Photograph taken December 1, 2002. California Highway 1: Moss Landing. Photograph taken December 1, 2002. This is the southern Sierra de Salinas in an area known as Paloma Ridge. Photograph taken from Monterey County Route G16 (Carmel Valley Road) near the divide between Carmel Valley and Arroyo Seco, November 22, 2003. Monterey County Route G16: 520000. Mission Road: near Mission San Antonio. This photograph was taken November 22, 2003, from the edge of US Highway 101 near Camphora. U. S. Highway 101: at Camphora. This photograph was taken November 22, 2003, from Arroyo Seco Road near Soledad. Lewis Creek from Mustang Ridge. Photograph looks northwest across Lewis Creek into San Benito County. California Highway 198 crosses Peachtree Valley. Whimsical fish hanging out in a tree. Spotted on Indian Valley Road. View of farm in Indian Valley. Photograph taken 17 April 2005. Field Notes: 17-Apr-05 at Indian Valley. San Lucas as seen from the Salinas River. Photograph taken August 21, 2005. Lockwood San Lucas Road: near Salinas River. View north in Peachtree Valley on CA Hwy 25. Looking west on California Highway 198 in Peachtree Valley. California Highway 198: near Peach Tree Road. Field Notes: 17-Apr-05 at Hwy 198. Photograph taken November 22, 2003. Monterey County Route G17: Mission Nuestra Señora de la Soledad. Looking southeast in Peachtree Valley. Photograph taken 18 April 2004. Intersection of Peachtree Road and Indian Valley Road. In 1849, Antonio Ramirez built a small adobe on the El Camino Real, near the site of the ancient Indian village, Holamna. As a main artery to California's gold fields, the El Camino Real brought many travelers past Ramirez's place. He transformed his adobe into an inn and stage stop and soon enjoyed a brisk business. Eventually, the Inn became the nucleus of the town of Jolon. Ramirez sold the building in 1871 and it changed hands three more times before it was purchased by Lt. George Dutton and Capt. Thomas Tidball in 1876. Dutton, who became the sole owner in 1878, added a second story of adobe and wood frame structures at either end. Jolon's first post office was located at the Inn, and Dutton added a store and saloon. The saloon boasted a huge fireplace, 6 or 8 poker tables, and an ornate bar which came around the Horn. By 1876, Jolon had grown into a thriving town serving the Los Burros Mines, surrounding ranches, and many travelers. However, when the railroad came to King City in 1886 traffic followed the railroad, and the old Camino Real fell into disuse. Soon after, the Los Burros Mines gave out as well, and business at the Dutton died down. William Randolph Hearst purchased the property in 1929 and removed the Dutton's outbuildings as well as many other Jolon structures. In 1940, the U. S. Army acquired the property, and the adobe was used as a bivouac area. Vandalism and exposure to the elements finally destroyed the building, leaving only an adobe ruin. The building was placed on the National Register of Historic places in 1976. County Route G14: at Dutton Hotel. Padre's Garden at Mission San Antonio de Padua. Mission Road: at Mission San Antonio. Looking east along California Highway 198. The Salinas River near San Lucas. Looking upstream, to the south. Lockwood San Lucas Road: at Salinas River. Looking downstream, to the north. Mount Diablo as seen from Tilden Regional Park. We hiked up the Big Springs Trail, nearly to Vollmer Peak, then took a shortcut to the ridge for this view. New Idria Road - San Benito County: 70000. Photographed August 1976, scanned from a print 11 February 2018. Field Notes: in Aug 1976. Photographed December 1978, scanned 9 February 2018. Field Notes: in Dec 1978. Photographed September 1981, scanned from a print 9 February 2018. Field Notes: in Sep 1981. Drawn 19 March 1987, scanned 9 February 2018. Field Notes: 19 Mar 1987. Alta Laguna Boulevard, Laguna Beach, Orange County, California: Alta Laguna Park. Field Notes: 11 Oct 2017. Pittsburgh Plate Glass Company at Bartlett, on Owens Lake. U. S. Highway 395: 55090. Two towers of the former salt tram visible from Swansea. California Highway 136: near Swansea. Field Notes: 16-Jul-05 at Swansea. Southern Pacific #18 in Independence. Field Notes: 16 Jul 2005 at Independence. U. S. Highway 395: 51990. In Bishop, on a sunny summer Sunday morning, we walked from our motel to downtown for breakfast. Along the way, I noticed the sun shining on this older house set back from the main street of Bishop. It still looks pretty good, though at one time it must have been someone's beautiful Owens Valley mansion. Former Southern Pacific stock car in Swansea. Former Southern Pacific section house in Swansea. Owens Lake from the Cerro Gordo Road. Landmark for Owens Lake Silver-Lead Furnace. The Owens Lake Silver-Lead furnace and mill was built here by Col. Sherman Stevens in 1869 and used until March 1874. James Brady assumed its operation in 1870 for the Silver-Lead Company and built the town of Swansea. During the next five years the output of this furnace and another at Cerro Gordo was around 150 bars of silver every 24 hours, each weighing 83 pounds. Plaque placed by the California State Park Commission in cooperation with the Eastern California Museum Association. November 5, 1961. Looking across Owens Lake to Cerro Gordo. Photograph taken July 15, 2005, from the edge of US Highway 395 near Bartlett. U. S. Highway 395: near Owens Lake..
Jack's Restaurant, breakfast was pretty good. California Highway 136: at SPRR Xing. The White Mountains as seen from US Highway 6 in Chalfant Valley. U. S. Highway 6: in Chalfant Valley. The full size map is ProjectedDay1a300dpi.jpg. California Highway 136: near Swansea. bet. Swansea and Keeler. at Cerro Gordo Rd. California Highway 168: at Death Valley Road. Dolomite Road, Inyo County, California: at Mine Access Road. Owenyo - Lone Pine Road, Inyo County, California: 50000. Portfolio of Maps: 4 Apr 2009. U. S. Highway 395: at Miller St. at Coso Junction. The full size map is ProjectedDay2Stops5-10-300dpi.jpg. "Owens River Road," Forest Road 2S07, Mono County, California: Hot Creek Recreation Site. Forest Road 3S07, Mono County, California: at Blue Chert Mine. Whitmore Tubs Road, Mono County, California: at Stop 2-10. Antelope Springs Road, Mono County, California: along the road. at Huntley Kaolinite Quarry. The full size map is ProjectedDay2a300dpi.jpg. Fish Slough Road, Inyo and Mono Counties, California: Fish Slough. U. S. Highway 395: at Big Pumice Cut. s. of Volcanic Tableland. U. S. Highway 6: at Rudolph Rd. Garlock Road, Central Mojave Desert, California: at Charley Rd. California Highway 14: in Red Rock Cyn. Fish Springs Road, Inyo County, California: along Fish Sprs Rd. Tinemaha Road, Inyo County, California: Poverty Hills. Whitney Portal Road, Inyo County, California: 20000. at access road. U. S. Highway 395: near Cottonwood Charcoal Kilns. at Little Lake Rd. Photograph taken 10 Oct 2009. Yucca Tree Street, Los Angeles County, California: at 38969. Palo Verde Mountains, Imperial County, California, with Milpitas Wash in the foreground. Photograph taken September 22, 2000, from California Highway 78. California Highway 78, "Ben Hulse Highway," Riverside, Imperial, and San Diego Counties, California: south of Milpitas Wash.
Field Notes: September 21, 2000. New Idria Road - San Benito County: 10000. Panoche Road - San Benito County: 61000. Photograph taken September 23, 2000, from the Arizona side. Parker Dam Road: Parker Dam. Remains of the general store and post office at the former town of Cross Roads. Photograph taken September 22, 2000. The sign at left reads: "In the 1930's during the period of construction of the Metropolitan Water District aqueduct and the Parker Dam, the town of Cross Roads developed to a population of about 2,000 - 3,000 people. The town consisted of 5 grocery stores, 3 restaurants, pool hall, barber shop, beauty shop, mortuary, bowling alley, 3 service stations, several garages, 2 used car lots, church, power plant, several saloons, several tourist cabins, and numerous residences. This is the remains of the Cross Roads Mercantile Co., later renamed Schwanbeck's, the most prominent business of the community. During this time the store also served as a U.S. Post Office. Operation of store continued until 1973." Parker Dam Road: Cross Roads. Colorado River bridge between Earp, California and Parker, Arizona. Photograph taken September 22, 2000. California Highway 62: in the middle of the Colorado River. In similar serpentine terrain in Marin County, I had these boulders described to me as "knockers of blueschist." Parkfield Grade, Fresno County, and Parkfield Coalinga Road, Monterey County, California: above Parkfield. Compromise joint in Parkfield Bridge. Parkfield Grade, Fresno County, and Parkfield Coalinga Road, Monterey County, California: at Little Cholame Ck. Parkfield Grade, Fresno County, and Parkfield Coalinga Road, Monterey County, California: at Parkfield Bridge. Notice the bend in the bridge mid-span. Cholame Road, Monterey County, and Cholame Valley Road, San Luis Obispo County. : near Parkfield. Vinyard Canyon Road, Monterey County, California: near Cholame Rd. Rejuvenated Hot Spring After San Simeon Earthquake. Photograph taken December 26, 2003. A magnitude 6.5 earthquake struck the central California coast on December 22, 2003 at 11:15:56 am (PST). The event was located 11 km NE of San Simeon, and 39 km WNW of Paso Robles, where the brunt of the damage and casualties occurred. Two deaths occurred due to a building collapse in Paso Robles. The magnitude 6.5 temblor ruptured a hot springs aquifer and as much as 1,000 gallons per minute of sulfurous water is pouring out of the ground at the City Hall parking lot. The rupture was caused by the quake because it started the same day. It first appeared as a steaming spring about 4 inches high and 24 inches in diameter in the Paso Robles City Hall Parking lot (P. Rafferty, pers. comm.). U. S. Highway 101: Paso Robles rejuvenated hot spring. The hot spring on 19 April 2004. Rejuvenated hot spring after 6 days. Photograph taken December 28, 2003. Collapsed roof in downtown Paso Robles. The Acorn Building, shown here collapsed, was built in 1892 of unreinforced masonry. It had a third story clock tower that was a highlight of Paso Robles architecture. The two women who perished in this earthquake were killed by falling debris under the collapsing roof. U. S. Highway 101: Paso Robles downtown earthquake damage. The Hot Spring in August 2005. This photograph shows an outer layer of brick veneer that has fallen off of the building. A new pump is tried in the rejuvenated hot spring. When I first saw the rejuvenated hot spring, Friday, 26 December 2003, a hole about 10 feet deep and 30 feet in diameter had been dug in the parking lot. Various approaches to pumping out the water were being tried. A pump was lowered part way into the pit, but several days later it had been removed. City officials have not figured out a way to stop the flow. U. S. Highway 101: 702107. The warm water has the rotten-egg smell typical of hot springs. State water officials said the sulfurous water does not pose a public health threat but may be harmful to the Salinas River ecosystem. In addition to sulfur, the water could contain other dissolved minerals that could be toxic to fish. The warm temperature of the water may also be harmful. The water was being channeled into the city's storm drain system, which eventually empties into the Salinas River. U. S. Highway 101: 702105. Intersection of Highways 25 and 198 in Peachtree Valley. A careful eye can also see Peach Tree Road. Sorry about the poor contrast, but it was a very cloudy day with not much light. California Highway 198: at CA Hwy 25. California Highway 25: at CA Hwy 198. View from the pass where Peach Tree Road becomes Indian Valley Road. Looking north in Peachtree Valley from near CA Highway 198. View towards the High Peaks from the Chaparral parking area. California Highway 146: at Chaparral Parking Lot. Junction of Balconies Cliffs Trail, Balconies Caves Trail, and Old Pinnacles Trail. View of Chalone Creek canyon from Balconies Trail. Rocks at Pinnacles National Monument. Cheryl climbs through the Balconies Caves. Tom at the west end of the Balconies Caves. View of the Pinnacles from the canyon below. Climbers at Pinnacles National Monument. The day I visited every possible spot for climbers was occupied. Photograph taken 15 April 2012. Chimney Rock Road, Marin County, California: at end. Field Notes: 15 Apr 2012. Drakes Beach Road, Marin County, California: near Drakes Beach. Chimney Rock Road, Marin County, California: at lifeboat stn. Potrero Hills from Joyce Island bridge. Photograph taken July 23, 2000. My collections 263. Lepidium latifolium and 264. Frankenia salina were made near the bridge abutments on the right-hand side. Potrero Hills looking northwest from the bridge over Montezuma Slough at Beldons Landing. Photograph taken July 23, 2000. The trailhead to Rainbow Falls is at the end of California Highway 203. The walk to view Rainbow Falls is downhill, a little more than a mile. Once at the viewpoint, you can walk down a staircase to the bottom of the falls. California Highway 203 - Eastern Sierra: 27000. Field discussion at the Jepson Poaceae Workshop. Photograph taken 22 April 2012. Discussion led by Travis Columbus, instructor. View after the Rim fire. California Highway 120: at Rim of the World. Field Notes: 2 Oct 2013. U. S. Highway 101: in Soledad. This photo looks south from the County Route G16 bridge on the east side of the valley. The view is upstream on the river. California Monterey County Route 15 (Metz Road): south of CR G16. Monterey County Route G16: 899610. Harvesting lettuce in the Salinas Valley. California Monterey County Route 15 (Metz Road): south of railroad tunnel. Vinyard Canyon Road, Monterey County, California: near San Miguel. Looking east on Lonoak Road. Lonoak Road climbs above the Salinas River bottom and onto a mesa sloping upward to the east to the foothills of the Coast Ranges. Field Notes: 4-Feb-06 near King City. Looking toward King City on Lonoak Road. Lonoak Road: east of King City. Farmland near Soledad, Salinas Valley. Looking northwest from the Soledad exit of US Highway 101. Field Notes: 11-Nov-05 near Soledad. U. S. Highway 101: at Front Street north of Soledad. Grass farm near Greenfield, Salinas Valley. This photo looks northwest across the grass farm. The Sierra de Salinas is in the distance on the left. Monterey County Route G16: 899510. Looking northwest over vinyards in the Salinas Valley. California Highway 146: on east edge of Salinas Valley. This photo looks north from the County Route G16 bridge on the east side of the valley. The view is downstream on the river. The peaks in the distance are North Chalone Peak and South Chalone Peak. California Monterey County Route 15 (Metz Road): north of CR G16. Monterey County Route G16: 899600. Salinas Valley, Salinas River, and the railroad tunnel near Metz. Whimsical Reindeer Pumpkin beside the highway. U. S. Highway 101: s. of San Lucas. Dead Monterey Pine with pumpkin. This photo is taken on the east side of the valley, near the Salinas River. It looks west toward Greenfield. There is a grass farm along the road here. Monterey County Route G16: 899500. The city of Salinas in the Salinas Valley as seen from Fremont Peak. The Salinas Valley is very long and narrow. Even at this location, quite close to the Pacific Ocean, the valley is only seven miles wide. U. S. Highway 101: in Salinas. Slacks Canyon Road, Monterey County, California: on ridge. Slacks Canyon Road, Monterey County, California: near pkg area. Parkfield Grade, Fresno County, and Parkfield Coalinga Road, Monterey County, California: near Miller's Field. Sag pond along San Andreas fault. Hummocky terrrain across the San Andreas Fault. I think this is pretty close to Willow Creek, and therefore just north of the Melendy Ranch. Hill in Lewis Creek canyon. I thought this hill had a unique look to it. Perhaps traces of the San Andreas Fault pass on each side, and it has been uplifted. Field Notes: 17-Apr-05 at Lewis Ck. La Laguna Vieja Rancho, at Bitterwater Lake, along California Highway 25. Just south of Bitterwater, in Bitterwater Valley, is Bitterwater Lake. I'm guessing someone thought the water was bitter. Gudde (1969) notes at least fifty locations, lakes, and streams in California with a reference to bitterness of the water. "Amargosa" also refers to bitterness of the water, although modern Spanish uses "amargo" or "amargado" for the adjective "bitter." The location of Bitterwater Lake is also occupied by La Laguna Vieja Rancho. California Highway 25: at La Laguna Vieja Rancho. Field Notes: 17-Apr-05 Bitterwater Lk. Coalinga Road looking west from Old Hernandez Road. Coalinga Road - San Benito County: near Old Hernandez Road. Field Notes: 17-Apr-05 at Coalinga Rd. Coalinga Road looking east from Old Hernandez Road. The south end of Old Hernandez Road, at Coalinga Road. At each end of Old Hernandez Road, the road is paved. The middle section is a very good dirt road. Old Hernandez Road: at South End..
"Road Closed" sign on Old Hernandez Road. At about 12 miles (15 km), we came upon this "Road Closed" sign. I suspect it relates somehow to the ford of the San Benito River. However, we did not see a similar sign at the other end of the road. Old Hernandez Road: at End of Pavement. Field Notes: 17-Apr-05 road closed. Cows by the San Benito River on Old Hernandez Road. Just after fording the San Benito River, we came upon these cows. Old Hernandez Road: at About 5 Miles..
Field Notes: 17-Apr-05 ford San Benito R.. Looking downstream (north) on the San Benito River, just south of the former townsite of San Benito, Old Hernandez Road. About 1.6 miles (2.0 km) east of the San Benito townsite, Old Hernandez Road climbs up onto a small bluff. From this vantage point we can look back toward the townsite. This photograph is looking down river. The pinkish trees along the river are tamarisk. Field Notes: 17-Apr-05 View of San Benito River. Lewis Creek, sediment load exceeds the capacity of the creek. One thing that seemed fairly obvious was that the sediment load in Lewis Creek exceeds the capacity of the stream. Small valley parallel to San Andreas Fault, looking south toward the Schmidt Ranch. Small valley parallel to San Andreas Fault, looking north toward the Bear Valley Fire Control Station. Cold sulfur spring along Old Hernandez Road, San Benito County, California. We saw this spring along side the road. Thinking it might be hot or warm, I walked up to check the water. However, the water was cold, even though it smelled moderately of sulfur. Old Hernandez Road: at Sulfur Spring. Field Notes: 17-Apr-05 cold sulfur spring. San Andreas Rift Zone south of Paicines. The hills in the valley are probably pressure ridges. I had thought to stop here and look for the foundation being torn apart by the San Andreas Fault. Unfortunately, at the early hour on Sunday that I was here, there was no one around. This reservoir is perched above the valley floor at Paicines. It is probably an enlargement of a sag pond on the San Andreas Fault. Tectonic creep on the Calaveras Fault has offset this sidewalk about 3 feet. Coalinga Road - San Benito County: 30000. Coalinga Road - San Benito County: at Clear Creek Road. Clear Creek Road, the first of many stream crossings. Clear Creek Road - San Benito County: 89000. Serpentine barrens along Clear Creek near New Idria. Clear Creek Road - San Benito County: 40000. Shutter ridges along the San Andreas fault. San Benito River at the place we had lunch. Above Clear Creek and the motorcycle camp, there was one small unfenced area to pull off the road. The San Benito River was a small stream in this area. Coalinga Road - San Benito County: 70000. Field Notes: 4-Feb-06 along the San Benito River. Paicines Road to the right. Panoche Road - San Benito County: Paicines. Field Notes: 17-Apr-05 at Paicines. Coalinga Road - San Benito County: 69990. Field Notes: 4-Feb-06 on the San Benito River. Farm buildings remaining in San Benito. Old Hernandez Road: near San Benito. Serpentine conglomerate in the bed of the San Benito River. Coalinga Road - San Benito County: 69999. Field Notes: 4-Feb-06 on the San Benito River.. Looking up the canyon where we had lunch. Coalinga Road - San Benito County: 70010. View north in the upper reaches of the San Benito River. Coalinga Road - San Benito County: 79000. View northeast in the upper reaches of the San Benito River. Coalinga Road - San Benito County: 79010. Field Notes: 4-Feb-06 on Coalinga Road..
Benitoite was discovered on February 22, 1907 by James Marshall Couch while prospecting for quicksilver on a fifty dollar grubstake for shares from R. W. Dallas and Tom Sanders. On July 30, 1907, mineralogy professor George D. Louderback identified it as a new mineral species, Barium Titanium Silicate (BaTiSi3O9). He named it Benitoite after the river, county and nearby mountain range. The gem-quality crystal combines the color of a sapphire with the fire of a diamond. It looks like two studdy triangular pyramids attached at their bases; its shape is unique. It flouresces a bright deep-sky blue under ultraviolet light. Benitoite in gem quality occurs nowhere else in the world. It is assopciated with other rare minerals such as Fresnoite, Joaquinite, Natrolite, and Neptunite. They formed in fractures of a serpentine rock from hydrothermal solutions. Just how such solutions occurred and what other conditions caused the crystallization of these rare minerals is still not well understood. Benitoite was declared the official California state gem on October 1, 1985. Dedicated October 27, 2001. Monterey Viejo Chapter 1846 and James Savage Chapter 1852. E Clampus Vitus. Coalinga Road - San Benito County: at Benitoite Historical Marker. U. S. Highway 66 -- The National Trails Highway: in Ludlow. Photographed February 1985, scanned from a print 8 February 2018. House that my dad build; 12956 Woodcock Street. Photograph taken 30 April 2011. Field Notes: 30 Apr 2011. Photograph taken July 8, 2001. This is a typical summer day in San Francisco: cold and foggy. U. S. Highway 101: 500000. The Juan Sebastian de Elcano in San Francisco. A packed-to-the-gills street car rumbles by on its way to Fishermans Wharf. We gave up on waiting for a streetcar, and walked up to Pier 35. Photograph taken 22 December 2008. San Bruno Mountain as seen from Alameda. Photograph taken January 30, 2004. U. S. Highway 101: at San Bruno Mtn. Photograph taken January 21, 2004 from my office in the morning after a windy night and just after they washed the windows. U. S. Interstate 80: 12610. Soda Springs on the San Joaquin River. Field Notes: 10 Jul 2010. This view to the east is of the southern San Joaquin Valley looking toward Buttonwillow and Bakersfield. Photograph taken in May 2001. U. S. Interstate 5, south from Tracy to Santa Nella. U. S. Interstate 5: 55900. Sierra Nevada from near Merced. This photograph was taken from Cunningham Road just off California Highway 140. Photograph taken 13 Jul 2011. Field Notes: 13 Jul 2011. San Juan Bautista Mission seen from below the San Andreas Fault scarp. California Highway 156: near San Juan Bautista. Vicinity of Sulphur Springs on San Lorenzo Creek. Field Notes: 4-Feb-06 on San Lorenzo Creek. Sulphur Springs is right down below the road in the creek bed. Lonoak Road: at Sulphur Springs. Field Notes: 4-Feb-06 at Sulphur Springs. This is one of two creeks named San Lorenzo in California. The other is in Alameda County. There is also a San Lorenzo River in Santa Cruz County. This San Lorenzo Creek drains Peachtree Valley in the central Coast Ranges. Lewis Creek is a tributary, even though it drains a larger area. For most of its course San Lorenzo Creek flows northwest until it passes Lewis Creek, and then turns southwest, joining the Salinas River just south of King City. Lonoak Road: near San Lorenzo Creek. Lonoak Road: on San Lorenzo Creek..
Field Notes: 4-Feb-06 at San Lorenzo Creek. Field Notes: near San Lorenzo Creek. San Lorenzo Creek looking upstream. Photograph taken on a winter afternoon, January, 2002. U. S. Highway 101: in San Luis Obispo. 1401 Osos Street, corner of Osos and Pismo Streets. 971 Church Street, corner of Church and Morro Streets. Shell Creek, May 10, 1998. Photograph taken 10 May 1998. 1998 was an El Niño year. Shell Creek Road: at Shell Creek south. Shell Creek Road: at Shell Creek north. California Highway 46: on east side of Cholame Valley. Waves breaking on rocks near Cambria. California Highway 1: n. of San Simeon. Outdoor chapel at Mission San Miguel. Aerial view of San Luis Obispo. California Highway 1: San Luis Obispo. North of Ragged Point, the cliffs of the Santa Lucia Range plunge directly into the sea. South of Ragged Point there is a coastal plain for much of the California coast. California Highway 1: North of Ragged Point. Seals resting on rocks near Cambria. Looking south along Shell Creek Road. Shell Creek Road: s. of Shell Ck. Great Blue Heron on the cliffs near Cambria. Earthquake cracks on California Highway 46. This photograph shows cracks in California Highway 46, west of Paso Robles. This looked like differential settling in the fill materials crossing small canyons, as opposed to surface rupture along a fault. Moonstone Beach just north of Cambria. After lunch at Robin's in Cambria, we thought to walk on the beach. However, it was very windy, and no one wanted to be out in the wind for long. California Highway 1: Near Moonstone Beach. California Highway 58: Carrizo Plain. This photo was taken looking north. Hearst Castle is on the ridge at right. Notice the gentle coastal plain along the coast here. A little farther north, at Ragged Point, the coastal plain disappears and is replaced by steep cliffs plunging into the sea. The fault associated with the 22 December 2003 San Simeon 6.5 M earthquake, the Oceanic - Huasna fault passes from land to sea just south of Ragged Point. California Highway 58: Santa Margarita. U. S. Highway 101: near Santa Margarita. Looking north along Shell Creek Road. Shell Creek Road: n. of Shell Ck. Shell Creek Road: at Shell Creek tree. Jack Ranch Café and James Dean Memorial at Cholame, CA. The actual crash site is a half mile east on highway 46, and 200 yards to the west, in the middle of a farm field. The intersection was realigned when the highway was repaved and renumbered back in 1973. The old intersection and the last 8 miles of the highway that Dean traveled are on land belonging to the State Water Department, and The Jack Ranch, and permission must be obtained to walk or drive the short stretch of old highway. Mission San Miguel damaged by the San Simeon earthquake. U. S. Highway 101: San Miguel. Fault scarp along CA Highway 46. This fault juxtaposes Franciscan Formation above Miocene marine sediments. California Highway 58: Shell Creek. Photographed 20 January 2013, looking directly into the sun. California Highway 1: San Gregorio State Beach. Field Notes: 20 Jan 2013. Unnamed beach north of San Gregorio Beach. Heisler locomotive at the Scotia Museum. U. S. Highway 101: Scotia Museum. Photograph taken September 3, 2002. View west from Moro Rock. Mt. Whitney is the set-back peak directly above the vanishing point of the road. California Highway 136: near SPRR Xing. Understory vegetation is Great Basin Sagebrush. U. S. Interstate 80: Mystic. White Mountain Road, Forest Road 4S01, Inyo County, California: 58690. The railroad comes over Donner Pass, snow sheds can be seen to the left of the pass. Donner Peak is behind the tree at left. US Interstate 80 crosses Euer Saddle, not Donner Pass. U. S. Interstate 80: 24100. Lee Vining Canyon in October 2000. California Highway 120: in Lee Vining Canyon. U. S. Highway 395: 50200. California Highway 108: at Sonora Pass. California Highway 120: at Tioga Lake. Field Notes: Tioga Lake, October 6, 2000. Mount Dana on the left, and Mount Gibbs on the right. California Highway 120: near Dana Mdws. Fishing boat enters the harbor at Bodega Bay. California Highway 1: Bodega Bay. Salmon Creek Beach just north of Bodega Bay. Sand spit in the mouth of Bodega Bay. This sand spit forms the bay mount bar that closes Bodega Bay from the south, or lee side. The town of Bodega Bay is on the mainland in the distance. Sweetwater Mountains from Leavitt Falls. 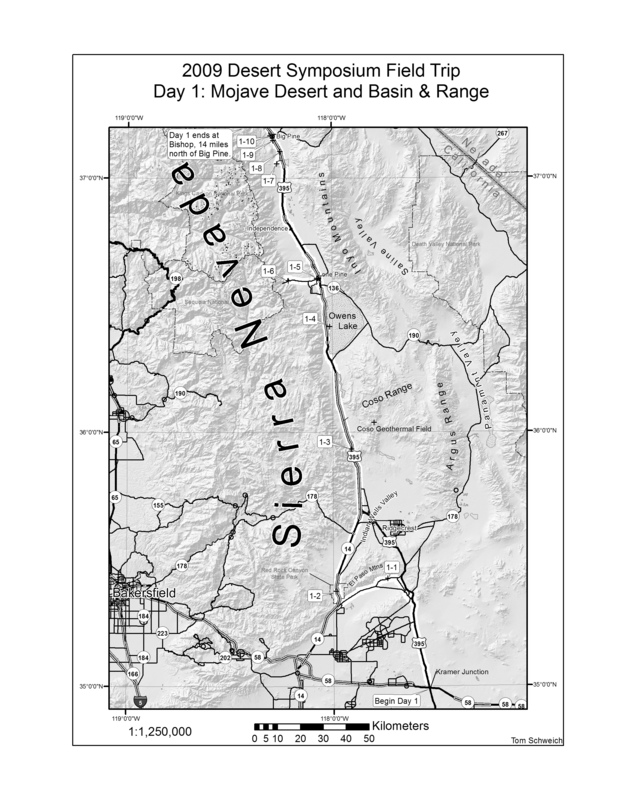 Field Notes: Eastern Sierra, October 8, 2000. U. S. Highway 395: Sweetwater Mountains. Lake Tahoe as seen from the south. The mountain across the lake is Mount Rose. U. S. Highway 50: at South Lake Tahoe. Tehachapi Valley and its Windmills. Photograph taken May 27, 2001. The orange flowers on the hills are California Poppies. California Highway 58: Tehachapi Valley. Photograph taken 21 April 2010. California Highway 58: near Tehachapi. Field Notes: 21 Apr 2010. Highway 58 approaches the west side of the Temblor Range. This small meadow is at the summit of the Temblor Range where it is crossed by California Highway 58. Photograph taken in May 2001. The Billy Goat in the Iron Zoo. The Chief in the Iron Zoo. I guess it's not very politically correct for the only anthropomorphic oil pump in the Iron Zoo to be a Native American. I noticed that the other sites with photos of the Iron Zoo do not show The Chief. California Highway 198: in Stinky Hollow. The Mouse in the Iron Zoo. The Rhinoceros in the Iron Zoo. The Giraffe in the Iron Zoo. The Zebra in the Iron Zoo. Snoopy in the Iron Zoo. Photographed October 1978, scanned 9 February 2018. Field Notes: in Oct 1978. Rachel, Jacob and Matt at the Merry-Go-Round. Don Pedro Reservoir and Jacksonville Road bridge. Wards Ferry Road bridge over Deer Creek. Don Pedro Reservoir where crossed by CA Highway 120. Don Pedro Reservoir on the Tuolumne River at Ward's Ferry. Field Notes: 4-Jun-06 at Wards Ferry. The fisherman had taken his boat into the log jam to fish. California Highway 108: at Pinecrest. Swimming beach at Pinecrest Lake. Bridge over the Middle Fork of the Stanislaus River at Columns of the Giants. California Highway 108: near Columns of the Giants. Columnar jointing at Columns of the Giants. California Highway 108: at Columns of the Giants. End of the Trail at Columns of the Giants. Looking west on California Highway 4. The highway bridge over Old River is seen in the middle distance. Mount Diablo looms over the delta in the background. Photograph taken March 30, 2002. California Highway 4: Victoria Island. Bowmans Wash, looking north from near Cross Roads on Parker Dam Road. The Mojave-Mobile poses before descending into Copper Canyon and the Chemehuevi Indian Reservation. Power Line Road: View of Lake Havasu City. Field Notes: Whipple Mountains, September 22, 2001. Photograph taken September 23, 2000. Lake Havasu City, across the Colorado River from the Whipple Mountains. Merced River just below Happy Isles. California Highway 120: at Olmstead Point. Field Notes: 22-Sep-06 in Yosemite. California Highway 120: at Tenaya Lake. California Highway 120: near Tenaya Lake. Cheryl near Lembert Dome with Cathedral Peak in background. Field Notes: 24 Sep 06 in Tuolumne Meadows. Field Notes: 24 Sep 06 at Soda Sprs. Cheryl's photo of the Silver Apron. Photograph taken August 1, 2007. California Highway 120: in Tuolumne Meadows. Merced River at Swinging Bridge. View from top of Nevada Fall. Cheryl makes it to the top of Vernal Fall. Photograph taken May 14, 2005. Tuolumne Meadows from western edge. California Highway 120: at Tuolumne Meadows. I had climbed to the top of Pothole Dome. Never saw a big pothole, only this shallow depression. California Highway 120: near Pothole Dome. Lembert Dome from Pothole Dome. California Highway 120: near Lembert Dome. Tuolumne Meadows from Pothole Dome. California Highway 120: west end of Tuolumne Meadows. Coyote in Yosemite Valley, Yosemite National Park. Photograph taken 23 June 2011. Field Notes: 23 Jun 2011. Usually I sit out by the boulders and eat my lunch. Not today. We get wet at Bridalveil Fall. View of Yosemite Valley from Inspiration Point. California Highway 41: Inspiration Point. Yosemite Falls above a full Merced River. Lunch at the Silver Apron, above Vernal Fall. Cheryl on the bridge above Vernal Fall. Tom on the bridge above Vernal Fall. California Highway 120: at Tioga Pass. Field Notes: Tioga Pass, October 6, 2000. Field Notes: Tuolumne Meadows, October 6, 2000. Field Notes: Olmstead Point, October 6, 2000. Cheryl and Tom at the bridge below Vernal Fall. Photographed August 1956, scanned from a print on 19 February 2018. Great fun for Kevin and I; not so much for his dad. Field Notes: Late Summer 1956. Kevin fell off the log spanning the Merced River. Mr. Klages looks pretty happy so maybe we didn't drive him nuts. Two things to see in this photo: (1) the bridge is really narrow, and (2) there are no other people. These days the bridge would be mobbed. This photo was taken with a Brownie camera and a flash attachment with a Sylvania Blue-Dot flash bulb.